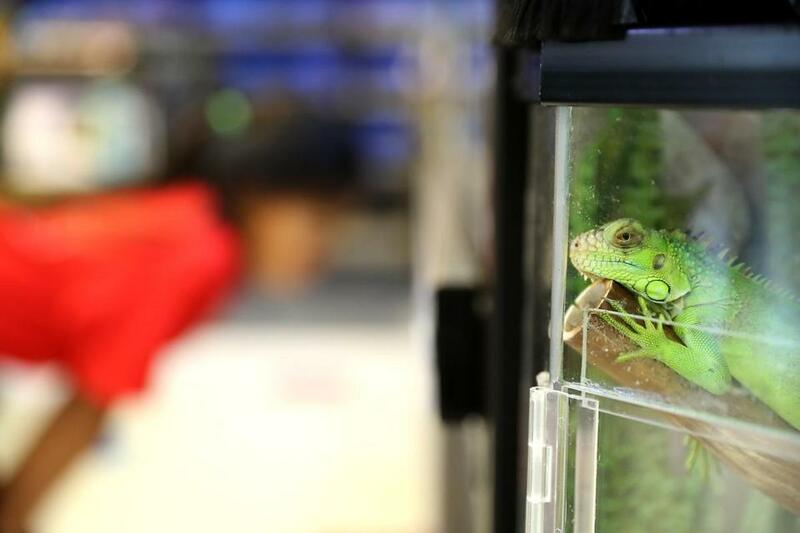 A green iguana stood guard as a customer looked at other reptiles at Petco in Needham. In what may be the most sweeping such ban in the country, pet shops in Cambridge will soon be barred from selling most animals unless they come from an animal shelter or rescue organization. After a year of debate, the Cambridge City Council on Monday approved a ban on the retail sale of commercially bred dogs and cats, as well as birds, amphibians, reptiles, arachnids, and so-called pocket pets, such as hamsters and gerbils. The ordinance, which will go into effect after a year, takes aim at the commercial breeding of animals, a controversial industry plagued with allegations of inhumane practices. The ban would impact the city’s two pet shops, national retailers Petco and PetSmart. The Cambridge ordinance follows a similar one passed in Boston last year banning the retail sale of commercially bred dogs, cats, and rabbits, and one recently approved in Stoneham that banned the sale of dogs and cats from so-called puppy and kitten mills. But Cambridge, which last year also banned the use of wild and exotic animals in traveling shows and circuses, went a step further than Boston, Stoneham, and hundreds of other US cities and towns with similar bans by including a wide variety of commercially-bred species. Last year, about 2,000 birds and pocket pets were surrendered to the MSPCA, Hagen said. The organization said it is seeing an increasing number of owners surrendering large birds, and an uptick in hoarding cases involving small animals, such as hamsters, guinea pigs, rats and reptiles. Hagen added that, on average, one in four people surrendering a small animal or bird said they bought them from a pet store. Neither Petco or PetSmart sell dogs or cats nationally, instead encouraging customers to adopt. But the stores sell other, smaller live animals, many from out-of-state breeders. Both companies declined to comment. But in a letter to the Cambridge council prior to the vote, a Petco executive said the company sources all of its live birds, mammals, and reptiles from vendors who meet the industry’s care standards. Voluntary standards developed by an industry trade group call for breeders and distributors of small animals to provide clean and safe living conditions, such as giving them room to move around, protocols for proper euthanasia, and health standards such as requiring breeding facilities have a consulting veterinarian. Marcie Whichard, Petco vice president of industry and public affairs, also indicated in her letter the ban would force the company to reconsider remaining in Cambridge, as the lease on its First Street location has expired and cannot be renewed. Mike Bober, president and chief executive of the trade association Pet Industry Joint Advisory Council, predicted the ordinance “is likely to have a profound impact” on the two pet chains. Vice Mayor Marc McGovern, who proposed the ban a year ago, pointed out the pet-store chains get most of their revenue from the sales of supplies, care, and training — and not animals. Live animal purchases made up 3 percent of the $67 billion spent on pet-related purchases in 2016 in the United States, according to the American Pet Products Association. McGovern said the ordinance will make it more difficult to, say, buy a tarantula on the spot, but he argues that’s not necessarily a bad thing. Many small animals end up as impulse purchases, he said. McGovern himself bought guinea pigs from PetSmart some years ago to appease his children, but he said he eventually ended up giving the animals away when the kids lost interest. The city plans to put together an advisory group chaired by McGovern to hammer out the particulars of the ordinance before it is implemented. Members would include representatives from the Cambridge Animal Commission, PetSmart, Petco, the MSPCA, Animal Rescue League of Boston, and the Humane Society of the United States. Curt Rogers, 55, a Cambridge resident who organized support for the ban, pointed to a recent case where dozens of Great Danes were rescued from squalid conditions in a puppy mill inside a New Hampshire mansion as an example of inhumane breeding close to home.